Oneness Productions proudly presents a night of St. Croix Roots Reggae for the whole family with the hottest female reggae artist to come out of St. Croix, Dezarie, backed by the band of Midnite with special guest Ikahba at the Miner’s Foundry on Tuesday, February 28. This community event is all ages so bring the whole family to enjoy conscious roots music plus craft vendors and Ital food & drinks from Kat’s Kitchen. Roots empress Dezarie (pronounced Dez–a-ray), has blessed the reggae community with the deliverance of her newest recording “Gracious Mama Africa”. Released on the Afrikan Roots Lab record label, this album emerges from the seeds planted on her amazing debut album of 2001 “FYA”. Gracious Mama Africa transports the incredible voice of Dezarie to a whole new level – the highest heights. Her foundation is firmly established in songs such as “Travelers” and the title track. The brilliance and clarity of Dezarie’s voice is reverently unveiled on “Exhalt”. Gracious Mama Africa abounds with pleas for social justice and racial equality with selections like “Poverty”, “Strengthen Your Mind” and “Justice”. 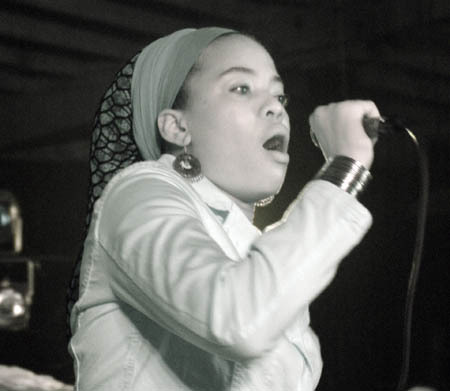 After receiving Atlanta’s “Best New Female Reggae Artist” award in 2001, Dezarie returned to her native island of St. Croix. Since that time, she has been working closely with Midnite, the players of instruments for “Gracious Mama Africa”. Midnite’s trademark sound is fully displayed on this album. Momentous bass lines from Phillip Merchant, classic one-drop from Dion Hopkins and the bubbling of Ron Benjamin on keyboards prevail throughout, accentuated by Abijah’s charismatic guitar playing. From the excellent overdubs of Dezarie’s voice to the flying symbols on “Slew Dem” it is evident that Ron Benjamin worked tirelessly in the production and mixing of this album. The fruits of this labour are eloquently displayed on Gracious Mama Africa which is sure to be one of the best roots albums of the year. Ikahba is the latest artist to emanate from the roots caldron currently bubbling on the island of St. Croix. His debut album ‘Troddin To Zion” was released in January of last year on the Afrikan Roots Lab record label. Like all ARL releases, “Troddin” features the preeminent roots band, Midnite, laying down some wicked bass lines and rhythms. Add a heavy dose of conscious lyrics along with Ron Benjamin’s unique engineering skills and you’ve got the recipe for another cruzial album. This event is sponsored the non-profit organization, The Rites Project, “RITES” stands for “Return Intention Towards Ecology Sustainability”. The Rites Project works with businesses, communities and schools to shift towards a harmonious relationship with the natural world through research, education and action.